Recommended summer reading to help you rethink purpose and strategy. The summer holidays are always a good time to take a step back and reflect on the longer term challenges you face with your organisation. Today organisations of all sorts are facing change at a speed never experienced before. For organisations to be resilient and successful, they will need to focus and align their purpose, strategy, leadership and culture with the massive cultural changes of our time. We help organisations to lift their eyes from today’s immediate challenges and look at potential opportunities and challenges that will shape their future. By studying the future, organisations can better anticipate what lies ahead and create resilient business strategies that are adaptable to ever more rapid change. 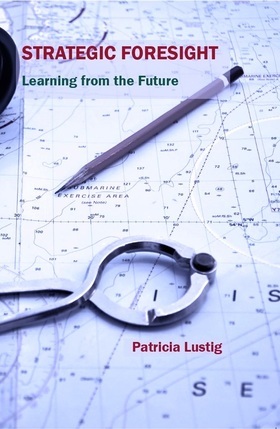 We are very pleased to be able to announce that Simplexity team member, Tricia Lustig’s third book “Strategic Foresight: learning from the future” was published on 21st July 2015. This is a practical (field) guide to foresight and foresight tools for leaders in business, the public sector and NGOs, to aid their practice in strategy, decision making and change. The book describes a set of skills and tools used to explore potential futures, so that you can plan for and take advantage of those futures. It covers models, tools and maps that you will find useful for developing your own Strategic Foresight and using this knowledge to make decisions, whilst uncovering innovation and creativity to turn this Foresight knowledge to competitive advantage. At Simplexity we have extensive experience with exploring the future, ranging from small and practical engagements that focus on a single issue, to using it in developing integrated, sustainable strategies. Many of our engagements started with a simple conversation on how strategic foresight might help. We have also run (half) day workshops to explore the possibilities in specific environments and clients have always been amazed of the outcomes, even after ‘just’ a day’s work. If you want to explore how this might work for you, please don’t hesitate to contact us. Copies of Tricia’s book can be obtained from Triarchy Press or on Amazon. “In the opening line of his 1953 novel, The Go-Between, L P Hartley wrote “The past is a foreign country: they do things differently there.” So too it will be for the future. We cannot know what will happen but we can prepare ourselves for success by developing the ability to recognise the future as it unfolds in the present: the only place we can make decisions and take action. In this short and easy to read book Tricia Lustig gives the reader tools to exercise what she refers to as their foresight muscles and illustrates each with her personal experiences as a strategist and foresight thinker. Building on shared knowledge and insights leaders should be able to address the fundamental risk management questions: What might happen? How will I know it is happening? What will I do if it happens? What can I do now to put myself in a better position to exploit the future NOW?